Muffin pans aren’t just for cupcakes. Here we use them to bake deliciously soft peanut butter-chocolate chunk cookies. 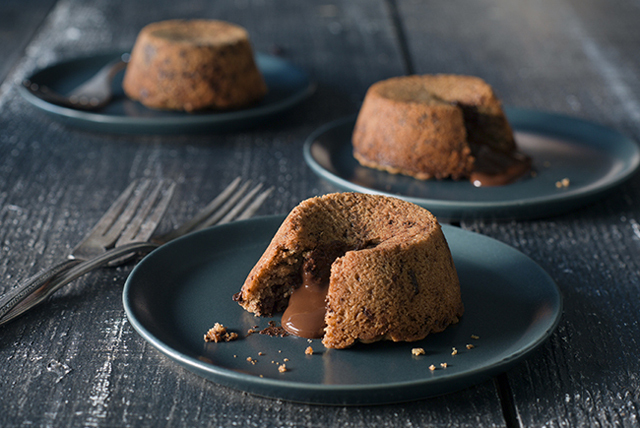 Take a bite to find an ooey gooey chocolate-filled centre. Why wait? Make this foolproof recipe for the chocolate lover in your life. Combine flour, salt and baking soda. Beat butter, peanut butter and sugars in large bowl with mixer until light and fluffy. Add egg; mix well. Chop 6 oz. chocolate; stir into dough. Press half the dough into 10 muffin pan cups sprayed with cooking spray, indenting centres slightly to resemble nests. Melt remaining chocolate as directed on package; spoon into indentations in dough. Cover with remaining dough. Bake 15 min. or until lightly browned. Run knife around edges of cookies; cool slightly before removing from pan to serve. Substitute 1-1/2 cups Baker's Semi-Sweet Chocolate Chips for the chopped Baker's Semi-Sweet Chocolate. Store cookies in airtight container at room temperature up to 3 days before serving.